This is St. Mary the Virgin. It’s located on 46th Street in Times Square. It’s always been a bit discombobulating for me to stumble across a church in an unlikely place like Times Square. 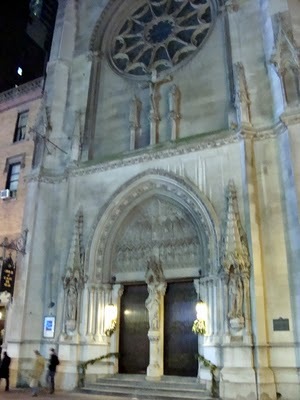 Neighborhoods in Manhattan are routinely torn apart and reinvented, but you don’t mess with church property, so you occasionally get these islands of Olde World New York amongst the skyscrapers. St. Mary’s was founded in 1868 when the neighborhood was still called Longacre Square. The neighborhood changed its name to Times Square when the New York Times moved it’s offices uptown to its present location. I was walking by one evening and was surprised to see a well-attended mass being celebrated. It could have been a holy day of obligation but that’s a world I left behind long ago, so I wasn’t sure. I saw a flash of color and light that looked oddly out of place. 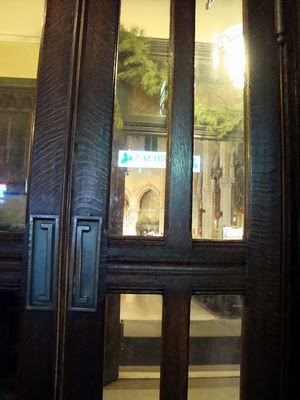 Initially, I thought it was inside the church but it turned out to be a reflection the doors of this 150-year old church. Upon closer examination, I could see that it was a reflection of the business located directly across the street on the south side of 46th. 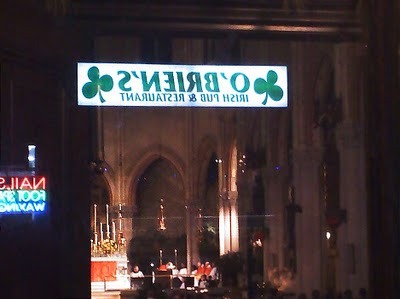 Is having an authentic Irish bar across the street from a Catholic church unusual? Not in New York City. In fact, it seems oddly appropriate. I’m not trying to nit pick but didn’t The Times recently move out of Times Sq. and into a new building across the street from Port Authority? Jeff: That’s absolutely TRUE! You’re not nit picking at all. You’re just being accurate. That’s a fairly recent development that only an insider would know. UB, it’s hard to figure which premises will house the more drunks. I’m no sure if you are aware, but masel, I live in an oul converted catholic church over here. The architecture and design of catholicism is far and beyond any other religious idiocy I have so far encountered. Yes, by all means it totally seems appropriate! It is probably nearly as old as the church too. Jimmy: Now that you mention it, yes, I do remember that you live in a converted church. Beautiful doors, right?Point: Oddly enough, the common denominator is the drink.Savannah: This town is a true original, although you should be happy your down there tonight and not up in this ice locker. It’s like living on Pluto. out here in the midwest, the catholic churches often share the responsibility. something called a ‘fish fry’ — friday nights, usually during lent — all the fish, beer and gambling you can do in an evening for $10. it’s for charity! how can it be wrong!